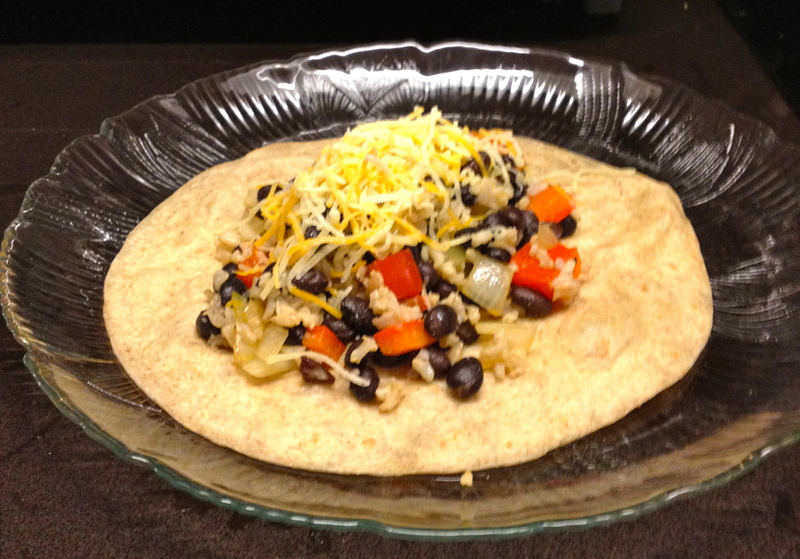 there is a ton of nutrition inside this vegetarian burrito! Enjoy this veggie burrito and get a hearty dose of fiber, protein, and a ton of vitamins including vitamin C, and beta-carotene (a precursor form of vitamin A that can be converted by your body). This easy-to-make dinner is filling, completely vegetarian and delicious! Enjoy with a few friends or eat 1/4 of the contents (for one serving) and save the rest for a meal later in the week. Craving more protein? Add in some tofu! However, rice and beans do offer all essential amino acids, when combined, meaning that this meal offers a complete protein – sans meat! 1. If using dried black beans, soak overnight according to package directions. If using canned beans, skip this step. 3. 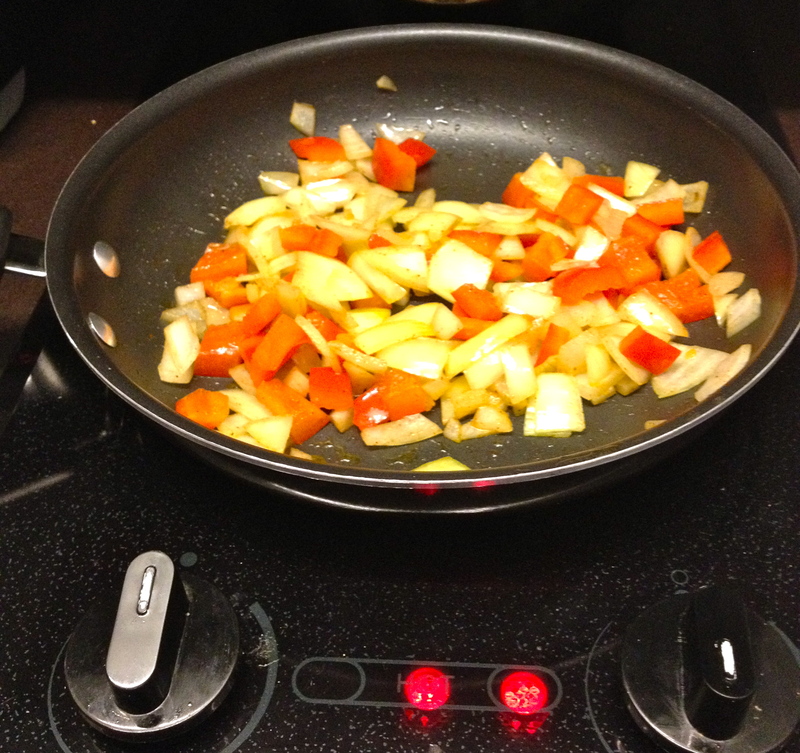 While rice is cooking, chop onion and bell pepper. If using canned beans, rinse and drain beans. 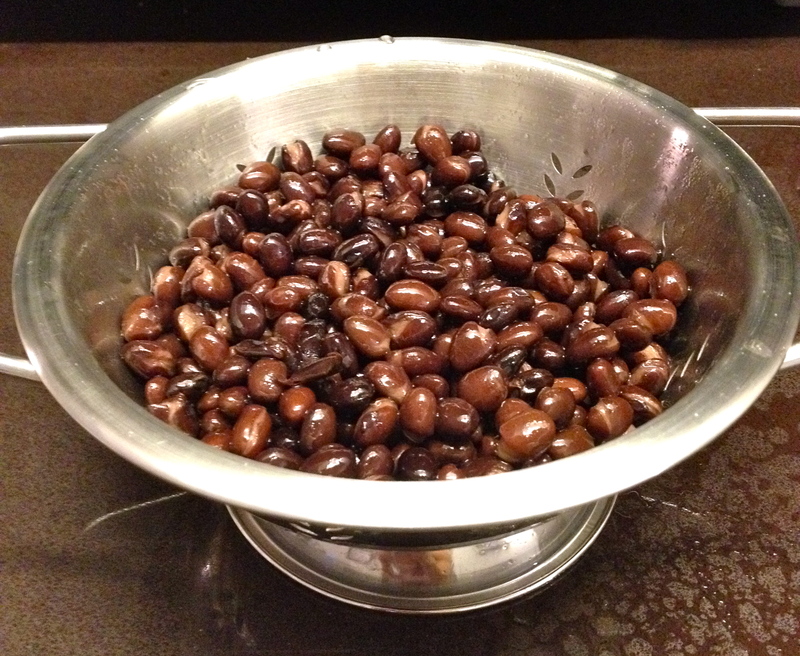 If using pre-soaked dried beans, remove from fridge and drain. 4. Pour olive oil in medium skillet and warm on medium-heat. 5. Add onion, pepper and spices (chili powder, cumin, ground black pepper). Allow to cook 8-10 minutes, until onion and pepper is tender. Stir occasionally. 6. 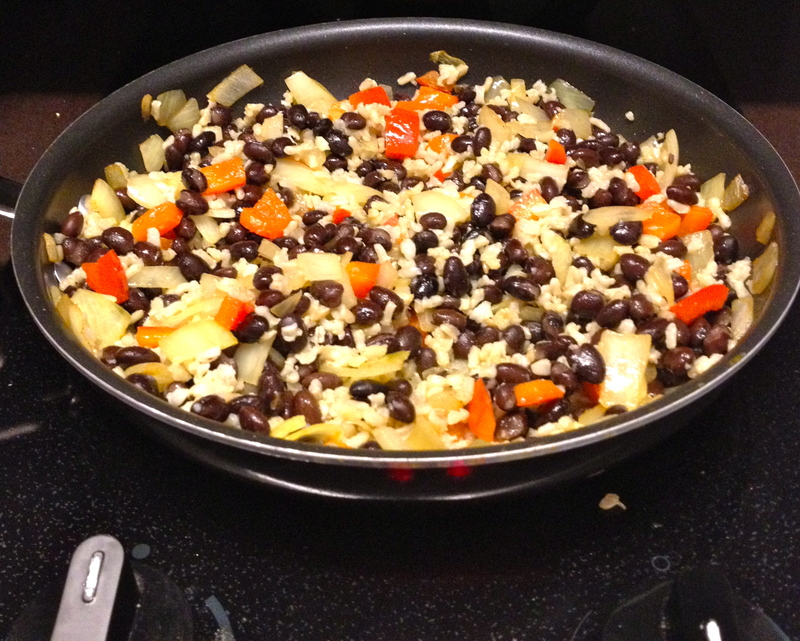 Once rice is done cooking, add rice and beans to skillet. Allow to cook approximately 5 minutes. Stir occasionally. 7. Warm tortillas in microwave (approximately 15-30 seconds). 9. 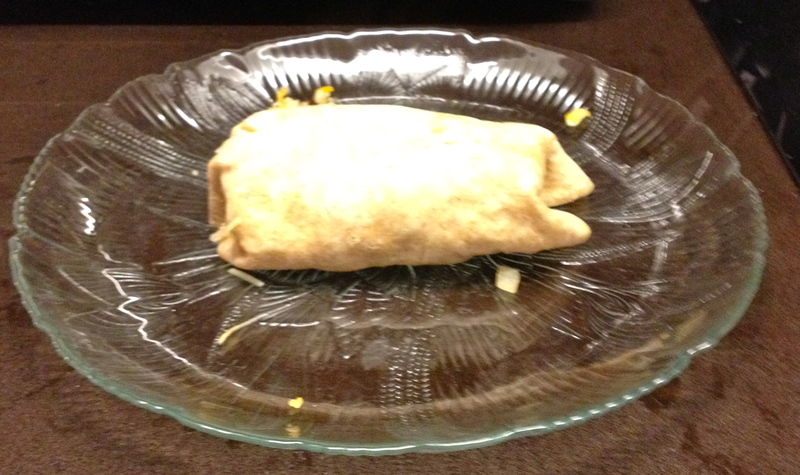 Sprinkle cheese (about .5 oz) on top on each burrito, while opened. 10. Wrap burrito by folding in opposite sides. Enjoy! now just wrap it up! Have Your Candy – And Eat It, Too! Trick or Treat – Give Me Something GOOD to Eat! 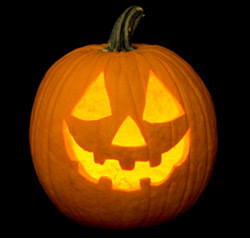 Halloween is around the corner – and that can mean a LOT of extra fat and sugar. Whether you have candy around because of trick-or-treaters, friends, children, or your own feeling that October merits candy, don’t sweat it! My advice? Enjoy the holiday and all of its goodies in moderation! Here are some healthy tips to help you enjoy your holiday – guilt-free! You CAN enjoy candy as part of a balanced diet. That is, fuel your body with foods that actually offer, well, fuel! Then enjoy some candy, in moderation, knowing that you have fueled your body right and can afford to enjoy a craving every once in awhile! Deprivation will only make your feel like you “deserve” a treat and, truth is, if you practice good nutrition, there is often a little wiggle room to enjoy “empty calories” every once in awhile, if you wish! 2. Why Not Have Some Nutrition With That Candy? To get into the spirit of fall and Halloween, you can enjoy healthier candy options! 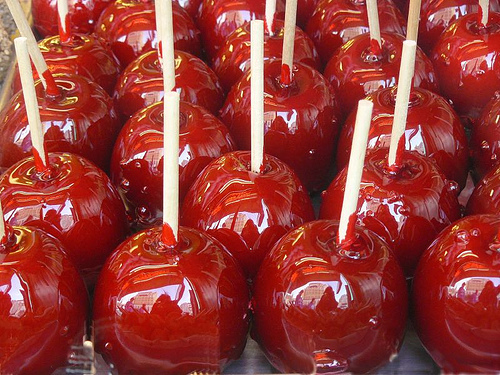 My favorites are candy apples or caramel apples. Granted, there are definitely healthier ways to eat apples. But, if you’re craving some candy, it can’t hurt to sneak in some nutrition with all of that sugar! A fun activity is making your own at home, using easy store-bought mixes that create sweet apple-y goodness in no time. For some extra nutrition (along with some extra calories), use caramel or candy as glue for chopped peanuts, dark chocolate pieces or any other topping you’d like! These toppings, specifically, offer some extra nutritional value to the candy, but remember, this is YOUR treat so top it with whatever you’d like! Other ways to get some sweet nutrition out of candy? Dark chocolate dipped fruit! My favorites are strawberries and bananas. Dark chocolate has a ton of nutritional benefits! Don’t overdo it- remember the principle of moderation. However, if chocolate is your thing, don’t sweat it! Look for dark chocolate that is at least 70% cocoa, since this is the minimum amount that will offer nutritional benefits, such as antioxidants. 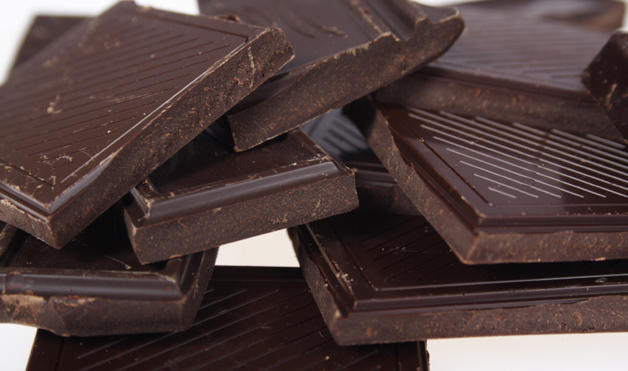 Also, some studies have suggested that dark chocolate aids in a favorable HDL:LDL cholesterol ratio. In other words, those who enjoy dark chocolate over other types of chocolate (milk, white) tend to have more of the “good” cholesterol (HDL) and less of the “bad” stuff (LDL). Once again, this is not proven, but it has been reflected in some studies. That being said – enjoy in moderation! 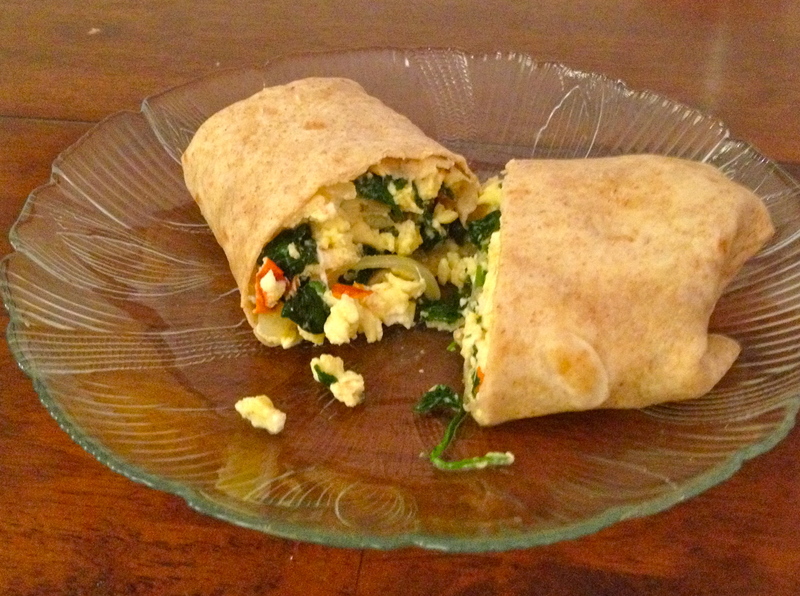 Wrap Up Some Good Nutrition for Breakfast With This Healthy Breakfast Burrito! On the go or right at home, this recipe is a breakfast MUST! This breakfast burrito takes less than 15 minutes to make and can be wrapped up to eat once at your desk, or it can be enjoyed steaming hot – right off the stove. This is a tasty, satiating breakfast that offers up some great nutrition to fuel your body for the day! I recommend using whole eggs, since most of the nutrition is in the yolk (most scientific studies suggest that the cholesterol in eggs does little to affect cholesterol levels, but if you are concerned about cholesterol or calories, use egg whites instead). Feel good fueling up, knowing that you are supplying your body with folate, beta-carotene, vitamin C, fiber, protein and a ton of other nutrients to get your day going! 1. Spray small skillet with nonstick vegetable oil cooking spray. Warm skillet on medium heat. 2. Crack 2 eggs (or pour egg whites into bowl). 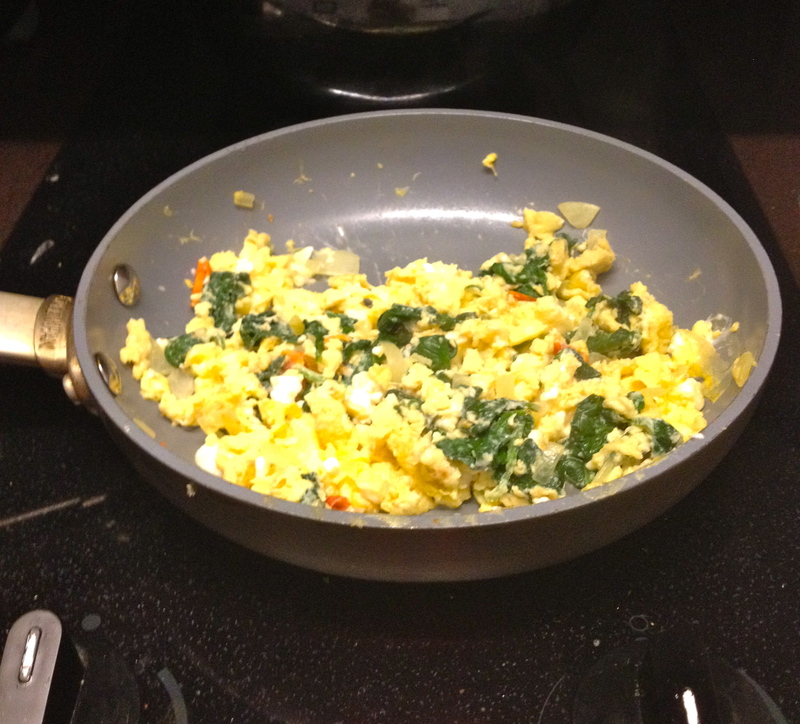 Scramble with fork or whisk. Set aside. 3. Chop onions. Place in skillet. Allow to cook 5-10 minutes, until translucent and slightly browned. Stir occasionally with spatula. 4. Chop tomato. Add to skillet. 5. Add spinach to skillet. Cook until wilted, approximately 2 minutes. Stir occasionally with spatula. 6. Pour scrambled eggs into skillet. Allow to cook until dry, stirring occasionally with spatula (approximately 7 minutes. 7. Add feta cheese. Cook for 1 minute, until cheese is slightly melted and warmed. While cheese is warming, place tortilla on microwavable-safe plate and warm in microwave (approximately 20-30 seconds). 8. Transfer skillet contents to center of tortilla. 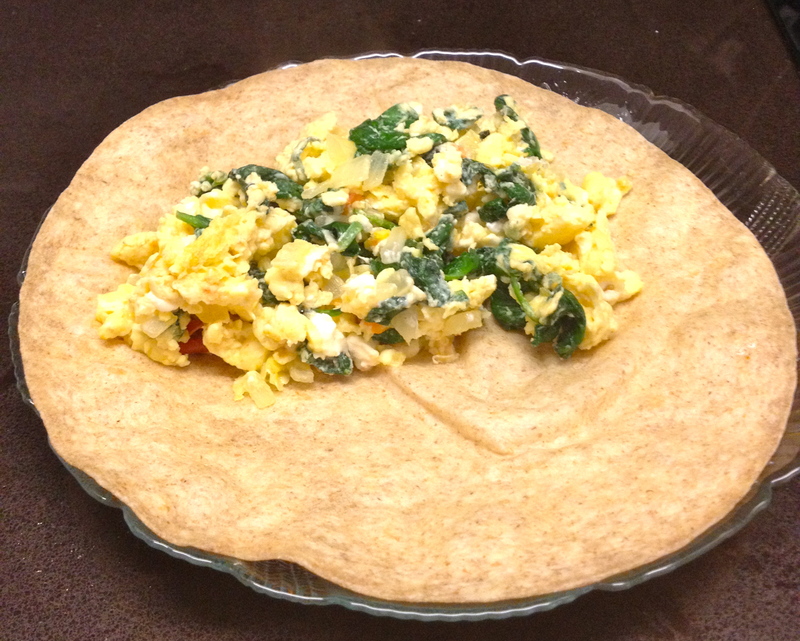 Fold in opposite sides of tortilla to wrap up and slice in half. Enjoy! *If you are on the go, wrap up the breakfast burrito in tin foil to keep hot and consume as soon as possible. 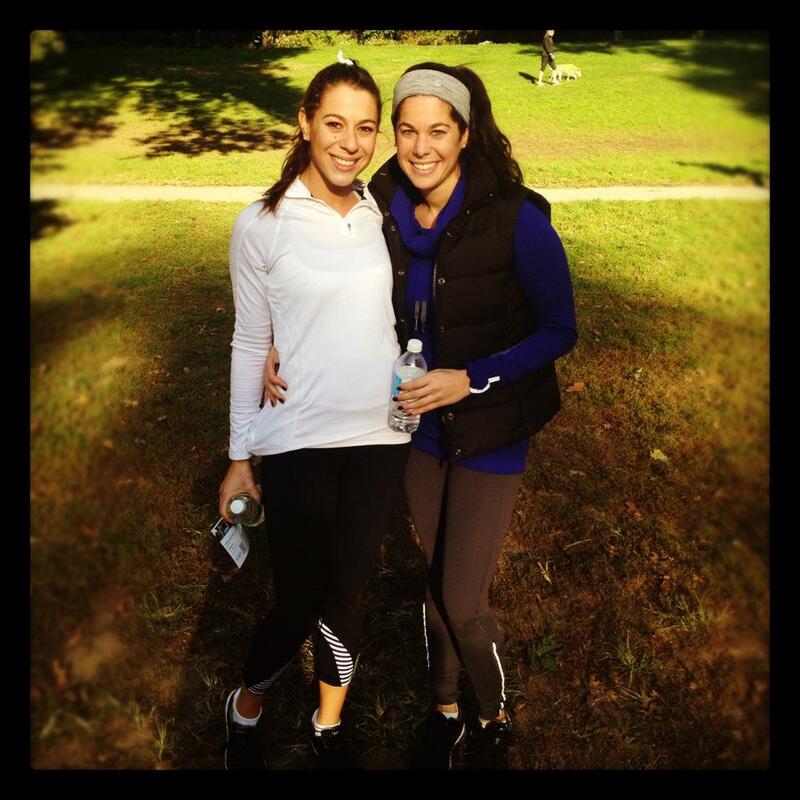 Fall Into Some Healthy Habits! Me, apple picking in Maryland! Find an orchard near you! Take A Bite Out of Fall! My favorite season is the fall – I love to be outdoors when the weather is crisp and perfect and the leaves are starting to turn. 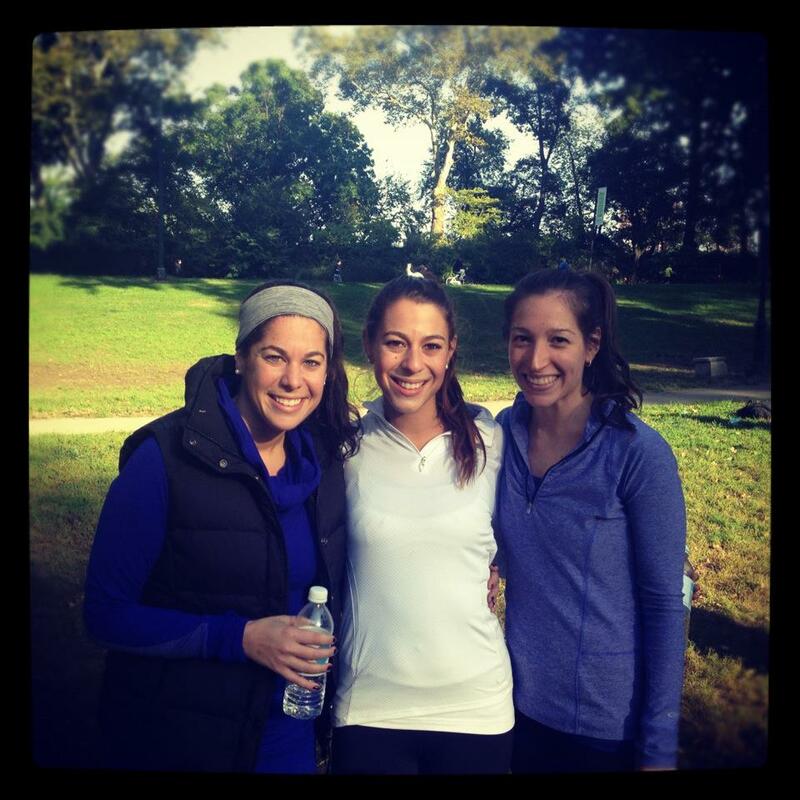 One of my favorite outdoor fall activities is going apple picking! Apple picking is a great way to enjoy the weather and pick out one of fall’s best fruits for yourself! Also, if you get the opportunity to go to an orchard and pick your own apples, you can speak with the farmers themselves and find out about how the apples were grown and which ones are the sweetest, the most sour, etc. Also, many orchards have a quaint store that features homemade jams, apple cider and other delicious fall treats! Well, maybe not all of the time – but apples are packed with a ton of great nutrition to fuel up your body! The skin contains some of the best benefits, including polyphenols (compounds found in plants) that function in a variety of ways to keep your body working and feeling great! Many of these polyphenols serve as antioxidants, which help to prevent damage caused by oxidative stress within the body. Apples are nutrient-dense, meaning that they offer a mouthful of nutrition for relatively few calories. Also, apples are a good source of fiber, which may help to keep you feeling full long after you eat your refreshing snack! 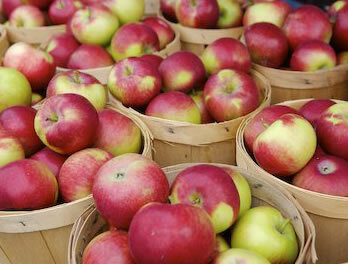 Lastly, apples are a juicy, delicious, easily portable snack that is whole, natural and REAL! 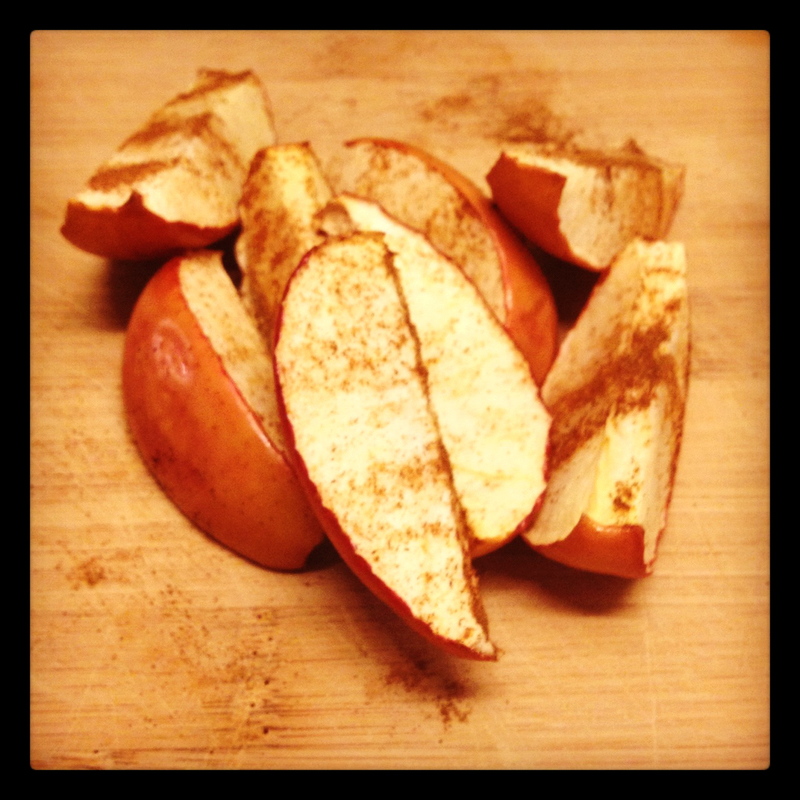 Easy Dessert – Baked Apple Slices with Cinnamon! Your kitchen will smell like fall for the rest of the day! Although I love apple picking, it isn’t the type of thing you usually do everyday. That being said, I like to load up on apples when I go. Although the best (and most real) way to enjoy apples is straight out of the fridge (or bowl, or wherever you store your apples), you can enjoy the health benefits of apples in a ton of other ways, too! One of my favorite desserts is a baked apple with cinnamon on top. Just preheat your oven to 350 (F), cut your apple into slices and place on a baking sheet. sprinkle cinnamon on top and bake in the oven for about 20-30 minutes, until the apple is browned and tender. Then, eat! Simple as that! Other great ways to enjoy apples are baked into some surprising recipes. For example, pork goes very well with apples – incorporate apples as a topping for pork chops, or use with other pork recipes to get a surprising fruit serving into your meal. Apples are also tasty in tuna salad, chicken salad, or topped on any salad, really! Also, apples are a great addition to green juices, since their sweetness counteracts the bitterness of many greens, such as kale and spinach. Check my recipes in this blog periodically and you’ll see that I love to cook with apples in the most surprising places! Apple cider (which contains many healthful and aromatic spices, unlike apple juice) is another great item to enjoy in the fall, either straight out of the fridge, or warmed on the stove. Sipping on apple cider just tastes like fall, to me! Let me know your favorite ways to eat apples!